Monarch Air Group provides private air charter in Fort Collins, CO. Our clients benefit from top-notch service, unrelenting dedication to safety, wide selection of aircraft, and years of experience in chartering private jets. To obtain a free quote, please use our online quoting tool provided below, or call toll free 1-877-281-3051. Located at the base of the Rocky Mountains, Fort Collins is a city in northern Colorado that is about 64 miles north of the state capital of Denver and 55 miles northeast of Boulder. Fort Collins is the most populous city and the county seat of Larimer County. The city has rich agricultural heritage and scenic beauty. In the 1860s the city was as a military fort along the Cache la Poudre River and was formed into town in 1873. 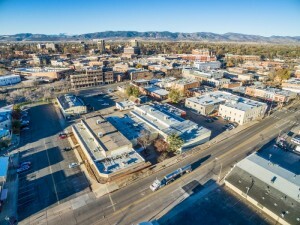 Fort Collins is a regional center of healthcare, shopping, and employment, and it has a wide range of industries, such as business services, manufacturing, high tech, agritech industries, clean energy, and bioscience. Fort Collins is a homeland to such large companies like Hewlett Packard, Intel, AMD, Anheuser-Busch and Woodward Governor, and to Colorado State University and plenty of research facilities. Fort Collins is renowned for its unique breweries, such as New Belgium Brewing Company, Anheuser-Busch, and Fort Collins Brewery. Named as “The Choice City” and “Adventure Casual” the city offers amazing entertainment opportunities, wonderful cultural attractions, various shopping boutiques, restaurants, and bars. Fort Collins is a gateway city to Rocky Mountain National Park. The city is served by Vance Brand Municipal Airport (LMO), Greeley-Weld County Airport (GXY) and Fort Collins-Loveland Municipal Airport (FNL). 1. BJC, Jeffco, Broomfield, United States. 2. CYS, Cheyenne, Cheyenne, United States. 4. FEW, Warren AFB, Cheyenne, United States. 5. FNL, Municipal Airport, Fort Collins/Loveland, United States. 6. GXY, Weld County, Greeley, United States. 7. LAR, General Brees Field, Laramie, United States. 8. WBU, Municipal, Boulder, United States. 1. Armstrong Hotel, 259 South College Avenue, Fort Collins. 2. Armstrong Hotel, 259 South College Avenue, Fort Collins. 3. Hilton Fort Collins, 425 W. Prospect Road, Fort Collins. 4. Armstrong Hotel, 259 South College Avenue, Fort Collins. 5. Hilton Fort Collins, 425 W. Prospect Road, Fort Collins. 6. Armstrong Hotel, 259 South College Avenue, Fort Collins. 7. Hilton Fort Collins, 425 W. Prospect Road, Fort Collins.